Summary: Scott Thomas's performance provides plenty for a receptive audience to ponder over long after the credits have rolled. 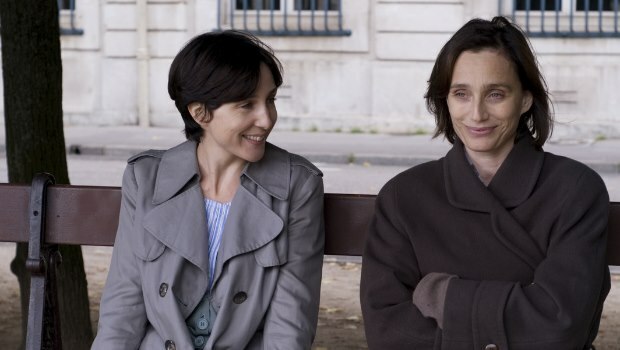 Philippe Claudel’s film opens with a shot of Kristin Scott Thomas’s Juliette, alone in an airport coffee shop. In cold stillness she stares at nothing. Her expression is unfathomable, but the eyes clearly hold secrets and burdens that will not be given up easily. Through the course of this excellent drama, Claudel’s camera will look at many other people and places, but it will always return to this haunted face. Enigmatic, closed and deeply troubling, this mask is the crowning achievement of a subtle and highly memorable performance from the English actress, who dominates this film. Scott Thomas’s appearances in French films continue to set her apart from the average British actress, and as this performance fully confirms, she is not an actress who should ever be classed as average. Juliette is met by her sister Léa (Elsa Zylberstein) – introduced in completely contrasting style, in a blur of handheld camera – and we discover that this is the sisters’ first meeting in 15 years, in which time Juliette has been disowned by her parents, divorced by her husband and forgotten by everyone except Léa. As the story unfolds we will learn of the terrible crime that Juliette committed in order to earn such treatment. The film initially presents Juliette’s 15-year absence as a compelling mystery, but rather than using this premise as an opportunity for melodramatic grandstanding, the majority of scenes are quiet, subtle constructions, with characters talking in everyday domestic or social situations. So while the story is structured around gradual revelations of what took place in the past, the script is focused on investigating Juliette’s present psychological state, and the impact that her return has on her sister, her sister’s husband and children. This focus on character gradually draws the audience away from the desire for a simple explanation of why Juliette did what she did, into an appreciation of the complexity of her character. In one effective scene Léa is leading a group discussion about Dostoevsky’s Crime & Punishment, and erupts in anger at a student’s suggestion that the author successfully maps the mind of a criminal. The scene questions art’s ability to fully comprehend or do justice to the human mind, and Scott Thomas’s performance is a kind of response to, and acknowledgement of, this challenge. So it doesn’t quite fit when the film actually delivers the answers to the mystery of Juliette’s crime, undermining some of its more complex questions by offering a get-out for the audience: it seems to say ‘don’t be provoked to think too much – there’s a simple explanation after all’. While on a surface level the film needs this narrative closure, on a deeper level it may have been more effective for Claudel to leave things open. This is not a major problem though, as Scott Thomas’s performance provides plenty for a receptive audience to ponder over long after the credits have rolled.